Welcome to Pink Lily, an Online Boutique! From the latest styles to classic pieces you can’t live without, Pink Lily is the ultimate online boutique! We have the trendiest clothing, shoes, and accessories to make you look and feel your best all the time. Our seasonal styles are everything... you’ll always find something new to fall in love with, at a price you can afford. We even offer custom monogramming for tons of apparel and accessories! Since we design, source, and manufacture most of our pieces in America, you can expect top quality products that maintain socially responsible sourcing and manufacturing practices. Check out our collection of dresses, tops, bottoms, and accessories to discover cute and comfortable styles! Get 20% off your first order when you sign up for our Email Newsletter! Tag us on Instagram to win a $100 gift card and be featured on our site! Pink Lily Jewelry Mystery Bag! We have dresses for every occasion! From floor-length maxis and knee-length midis to adorable minis and rompers - we have it all. Check out our new arrivals and find something to love every day! Our collection of tops includes blouses, tanks, graphic tees, and so much more. We also carry must-have workout tops for your next fitness sesh. Don’t head out to yoga class without some of our essentials, like workout separates, camisoles, and scoop neck tops! Our online boutique offers the absolute cutest jeans, leggings, shorts, and more for the perfect outfit. You’ll also find super comfy pants for lounging around the house or working out. There’s something for every occasion - from brunch with the girls to running errands! Personalize your wardrobe or give a custom monogrammed gift to a friend! Our online boutique offers monogramming on nearly every item, including most of our clothing and accessories. Choose your favorite font and color for a totally unique look! Our curvy selection is specially curated for ladies who love their curves. Flaunt your feminine figure with our selection of trendy options that include the latest dresses, tops, and bottoms. Embrace your curves and spoil yourself with something extra special from Pink Lily! There’s no such thing as too many shoes! At Pink Lily, our footwear collection includes the trendiest boots, wedges, sandals, and heels to complete any outfit. Step out in style when you choose from responsibly-made vegan leather or faux suede! Pair your fave Pink Lily looks with stylish accessories, like handbags, hats, scarves, and jewelry. Finding the right accessory can transform your outfit from workweek uniform to night time chic in an instant! Check out our sale and clearance items for the best savings on your fave clothes, shoes, and accessories! Items change daily, so check back often for our newest deals! We feature new items in our online boutique daily! We’re always stocked up on the trendiest seasonal styles, so check here for our latest additions and must-have wardrobe essentials for looks that are on-trend and totally cute! We’re always here for you! 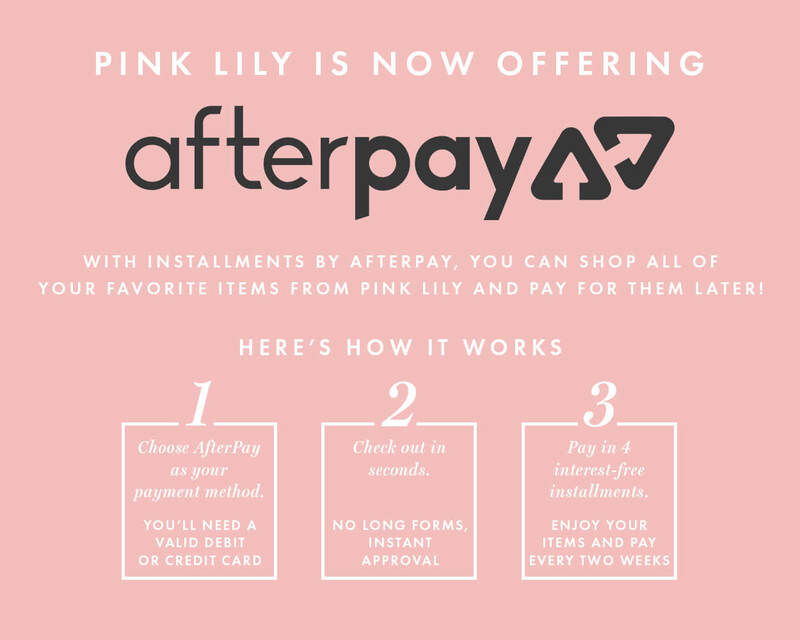 Pink Lily provides our customers with top-of-the-line service, including fast shipping, style tips, and more. If there is anything our online boutique can do to assist you, drop us a line today!